Many companies claim to be green, but SunChips has a solar-powered plant, the rest of their energy use is offset by energy credits, and they are contributing to the rebuilding of the town of Greensburg, Kansas. The first of their seven plants began using solar energy on Earth Day, April 22, 2008, in an effort to show consumers that they care about the environment. They are working to truly live up to their name. Ten acres of solar collectors were added to the Modesto, California plant producing 75% of the energy needed to produce chips at that plant. The total annual capacity is 147000MM BTU. The climate in California made this plant the obvious choice for solar power, as opposed to the SunChips plant in Maryland. The company worked with the California Energy Commission. The solar panels were approved by the National Renewable Energy Laboratory, a part of the U.S. Department of Energy. The sustainability efforts of SunChips don’t stop there. They are also looking into manufacturing processes which use less water and less power. They are also installing fuel-efficient ovens. The company is in the process of adding 50 acres of solar collectors to their Arizona plant. Even their publicity is environmentally friendly. They have billboards which use the sun’s shadows to spell out “SunChips”. They also created a solar-powered newspaper ad which can only be seen if you hold it up to the sunlight. Another major project has been the rebuilding of Greensburg after it was destroyed by a tornado in 2007. With the help of Planet Green, The Discovery Channel, and Leonardo DiCaprio, SunChips is helping to make this town the greenist place in America. SunChips has donated a million dollars to solar panels and to help small businesses rebuild. Their publicity campaign to inform consumers of their eco-friendly production processes is paying off. Their sales are up almost 20%, totaling over 200 million dollars. Frito-Lay, the company that owns SunChips, says that the benefits of their multi-million dollar investment are well worth the cost. They believe that their sustainability efforts will encourage their consumers to help the planet. They are not simply "greenwashing" their product to appear eco-friendly. They are making serious changes to their production process and significantly helping the environment. Dougherty, Jared. 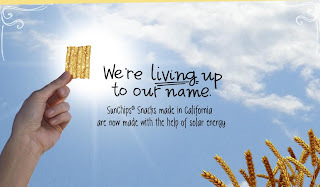 "SunChips Marketing Campaign Brings Light to Its Solar Energy Efforts." Reuters: April 3, 2008. Elliott, Stuart. "Trumpeting a Move to Put the Sun in SunChips." The New York Times: March 27, 2008. "Healthier Planet." November 29, 2008. http://www.sunchips.com/healthier_planet.shtml. Hein, Kenneth. "Do Consumers Care that Sun Chips are Solar Powered? Apparently." July 15, 2008. You may be qualified for a new solar energy program.